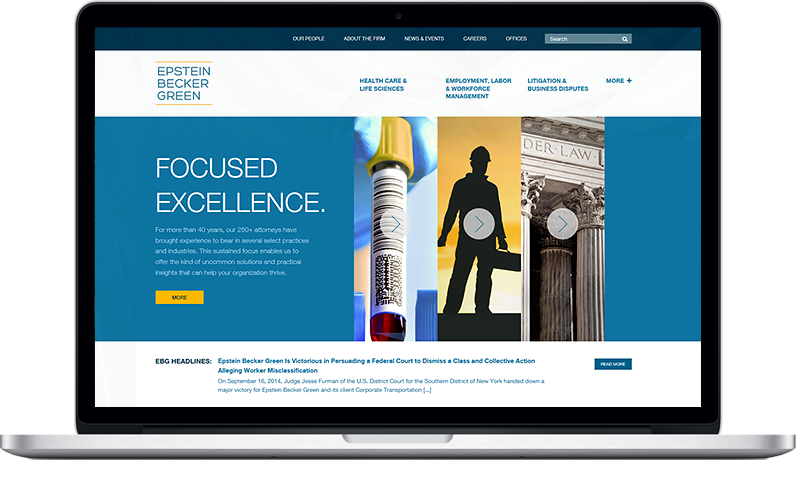 Epstein Becker Green, a highly focused “super-boutique” with over 250 attorneys, positioned itself for continued growth in its core areas with the launch of its new website: www.ebglaw.com. The website was designed and developed by Great Jakes and was built with Great Jakes’ unique Rainmaker CMS technology. Great Jakes collaborated closely with the firm to craft a website that would provide easy access to its vast library of content. It also devised a home page and website structure that effectively highlights the firm's key areas of focus: Health Care and Life Sciences; Labor, Employment and Workforce Management; and Litigation and Business Disputes. The website was built with "Attorney Microsites" -- functionality that Great Jakes pioneered that provides each of the firm's attorneys with small, highly customizable websites. An attorney's microsite could display podcasts, video, PowerPoint presentations, and twitter and blog feeds, as well as "custom pages" to highlight a specific aspect of an attorney's practice. Bradley Merrill Thompson incorporated video on a custom page highlighting his hobbies. David Garland's bio features his twitter feed. Mark Lutes, Lynn Shapiro Snyder, and Carrie Valiant showcased their involvement in EBG Advisors, National Health Advisors, the Health Care Industry Access Initiative, and Women Business Leaders in Health Care on custom pages.